Despite facing mega dams, colonialism and more than 500 years of violence and neglect, the Munduruku People have stayed strong and continued fighting for justice. Here’s a brief insight from their General Chief Arnaldo Kaba Munduruku, from his recent visit to the UK to work alongside Greenpeace. Dams in the Tapajos region of the Amazon could be about to force the Munduruku Indigenous People to leave their home against their will, losing their way of life, culture and livelihood. 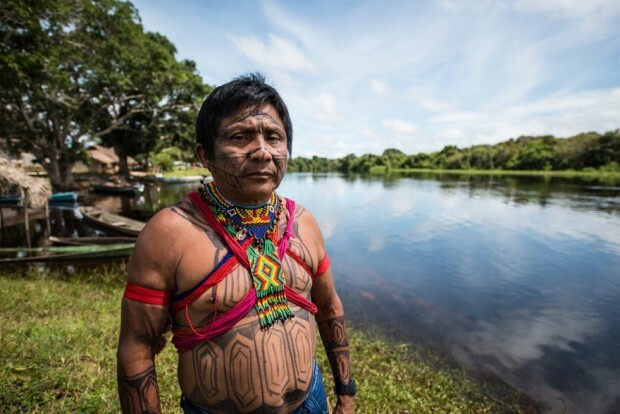 One million people globally have backed the Munduruku’s call for an end to destructive dams in the fragile Amazon – and the world is beginning to listen. Though one battle has been won, a longer fight continues. Munduruku people are now fighting to stop the other dams which threaten their land – and most importantly, they are fighting to get their Indigenous land recognised by the government. Respect for their land will stop the dams for good. About two weeks ago Arnaldo, together with his advisor Ademir came to the UK. While he visited many places and did many things I would like to recall one moment: the lunchtime talk in our London office where 80 people, counting both employees and volunteers, gathered together to hear what the Munduruku had to say. An eye opener for many, this opportunity was a very special moment and a humbling privilege where we gained a better understanding what it is like to to be at the forefront of the fight for climate justice, what is at stake and why we need to keep fighting. Here’s what they had to say. Arnaldo Kaba Munduruku, General Chief of the Munduruku, started with the following words “I came here on behalf of my People to thank you for your support in our struggle. The cancellation of the mega dam in the Amazon is not only good for us, but for all the local communities living in the region”. With a pretty packed agenda that included interviews with Channel 4 , visits to the British Museum where they got to see headdresses and other artifacts stolen Europeans in the 1800s and Siemens headquarters in Surrey, now was time to leave, but not without a few more words. Arnaldo said “They (the Brazilian Government and corporations involved in the building of the dams) think that we are a minority and that they can destroy us for their own benefit without regarding or respect for our right to life” and Ademir concluded “Their respect for our Land is not a favour, is their duty”. There are various ways you can support and show solidarity with people in the front line: get versed in the issues, spread the word, send a message of solidarity, pressure companies and governments and take direct action. We need to build a diverse and inclusive movement, understand how race and class are barriers both in the UK and globally and ask ourselves questions about how we work alongside and in solidarity with front line communities.